Link to the sCOA thread. Based on the 2010 Nationals I'm sure this will be another international event with lots of Canadian smarts attending. 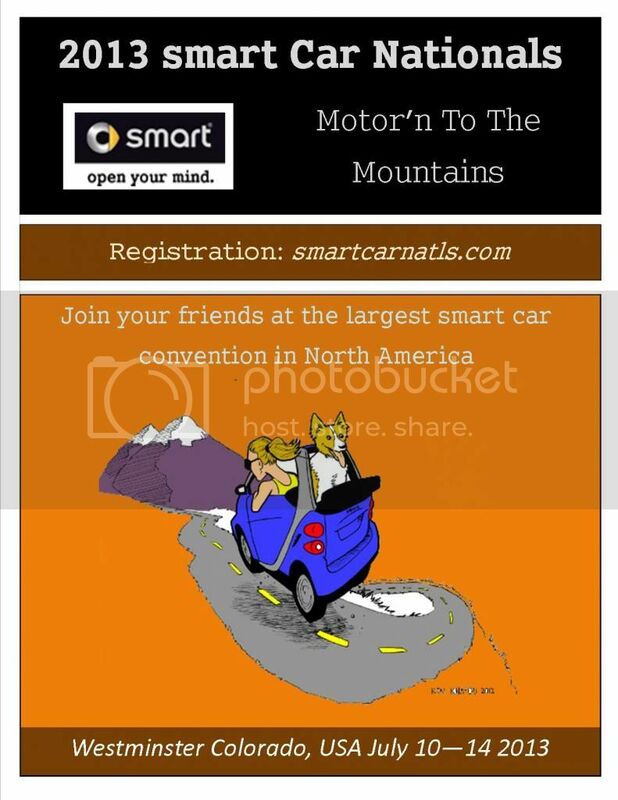 Event name changed to SMART car National Convention and Car Show. Thanks for spreading the word - hope to see lots of Canadian smarts in Denver next July. We can see no person by that name in the sign-up queue, so if he could tell us what name he registered under, that would allow some progress. 65% of new sign-ups are spammers so it takes a long time to sort the wheat from the chaff. Early bird pricing is still in effect so if you plan on going now is the time to register! Feel free to join (no cost), RSVP for the Nationals and start some caravan planning, plus anything else you'd like to add. See you there! Just a reminder that hotel registration for the Nationals close June 17th. So far only two Canadian cars are showing on the attendee map - anyone else coming? I am giving this some last minute thought... and registration does indeed close today! I registered for this yesterday. The countdown begins! Flossy and I are going to cross over at Sarnia around 3:30 am Monday morning. Taking I80 this will put us in Calfax Iowa by mid to late afternoon, close to a midway point. I have a room booked at the Colfax Inn. Making the rest of the drive on the Tuesday. We will see you there. Who's bringing the Smarties?